With the growing number of families choosing cremation, manufacturers have responded by developing an extensive number of offerings. Every year, new styles of cremation urns become available. 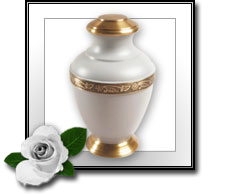 We provide a number of these cremation urns in popular styles fabricated in wood, marble, ceramic, bronze and other new materials. And our collection of uniquely designed biodegradable urns offers environmentally-conscious families choosing to scatter the ashes of a loved one many affordable alternatives.